Brad Pitt’s World War Z has some very retro gender politics. Brad Pitt’s attempts to adapt Max Brooks hit zombie novel, World War Z, have been bumpy since his production company bought the rights to the book in 2007. The script was rewritten in 2009 and again, twice, in 2012, blew over its budget, and had to be reshot by director Marc Forster. Brooks’ book, which shifts settings and characters from section to section, was always going to be a heavy lift to turn into a movie rather than a mini-series. 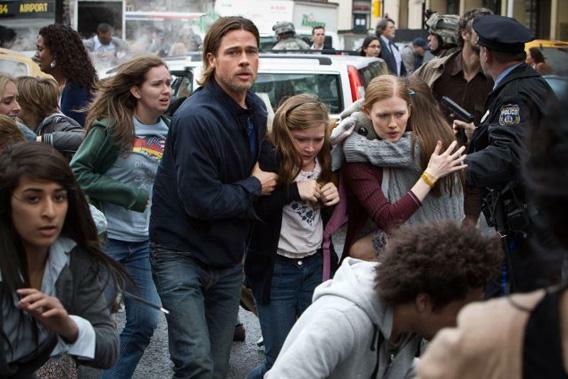 But as World War Z arrives in theaters today, the biggest disappointment isn’t just that the movie’s jettisoned Brooks’ smart, multiperspective approach to how different countries might respond to an apocalypse, but that it’s replaced his innovative narrative with a limp entry in what the New Republic’s Marc Tracy has dubbed the coming Daddy Wars. The morning the apocalypse begins, we meet Pitt’s Gerry Lane, who has retired from an exciting but risky job at the United Nations that took him to war zones like Liberia and the former Yugoslavia. “Do you miss your old job?” his daughter Constance (Sterling Jerins) asks him as he makes breakfast for his family. “No, I like my new job,” Lane tells her, regret flickering across his face as his wife Karin (Mireille Enos) searches for their daughter Rachel’s inhaler. “All you do is make pancakes in the morning!” Constance tells him. But never fear, Gerry isn’t subject to internal conflict about stay-at-home dad-dom for long. The zombie apocalypse that snarls up his morning carpool may be awful for humanity—much of which ends up chomped and converted into speedy monsters—but it’s terrific for Gerry, who is called back to duty by the U.N. and told that he must work to find a cure to the virus in order to keep his family under military protection. Restored by danger to what seems to be his proper role, Gerry thrives, saving Karin from looters, bashing zombies’ heads in, performing emergency battlefield amputations, and generally being a badass, while occasionally remembering to check in with his family in their makeshift home on a naval carrier. Karin, meanwhile, started out the movie being sensible and forward-thinking enough to snag flares from a grocery store, but spends much of the rest of the film snuggling her girls and an adorable Latino boy named Tomas. I understand why a complicated narrative had to be boiled down to a single main character and an simplified storyline for World War Z to make it to the screen. But having mom stay home with the kids while dad goes out and defends them to reclaim his manly honor seems unnecessarily old-fashioned—it’s so pre-apocalyptic.